Uneven sidewalks and walkways may seem like a minor problem, but they can be a serious safety concern due to the tripping hazard that they create. These uneven and cracked sidewalks can depreciate the value of your home, along with leading to some structural issues. Settlement: Improperly compacted soil can create settlement over time causing the concrete to sink. Soil erosion: Heavy rainfall can cause concrete to crack or buckle. Thermal expansion: Concrete expands during hot weather conditions and contracts in cold weather. This fluctuation can cause cracks in the sidewalk. Tree or shrub roots: Maturing trees or shrubs can grow under the sidewalk, causing damage. To prevent this problem, trees should not be planted too close to sidewalks. Heavy traffic: Heavy vehicles or heavy traffic on the sidewalk or walkway weakens them creating cracks on the surface over time. 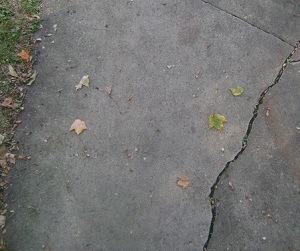 If you find that you have uneven or cracked sidewalks or walkways around your St. Louis or Kansas City, MO home or business, let the experts at Polyjacking.com, a division of Pro Foundation Technology, give you a free inspection and offer you the solution for your sidewalk or walkway repair needs. A 5/8" hole is drilled into the damaged area. Polyurethane foam is injected into the void. The foam expands and fills in the void. This helps lift the sidewalk back to its original level without replacing it. After the injection process, all holes are filled in and the equipment is removed. The polyurethane foam hardens within 15 minutes, allowing the sidewalk to be used quickly. Economical: Polyjacking is 75% cheaper than removing damaged concrete. Versatility: It can be applied to apartment buildings, shopping malls, sports arenas, libraries, concert halls, and other locations. Accuracy: Polyurethane foam precisely lifts the concrete within 10/1000th of an inch. Moisture Barrier: Polyurethane seals concrete cracks and joints to stop water intrusion. Conformability: The foam expands 20 times its liquid volume and moves laterally under the concrete surface. It contours to the size and shape of the voids providing 100% coverage. Light-weight: Polyurethane only adds 3-5 pounds per cubic foot to the sub-base to prevent stress to the soil. Structural support: Because our experts drill small holes into the affected area, this helps support and maintain the structure of the concrete. If you are in need of sidewalk or walkway lifting or leveling, Polyjacking.com is the concrete leveling provider to call. Our polyurethane foam will get your sidewalk or walkway level with little disturbance to your property. Contact us today!